Tuesday, 23rd Sept 2014. The palm oil futures closed lower yesterday amid weakness on Soy oil since last Thursday as both the edible oil recovery are slowing down. "-U.S. stocks closed sharply lower on Monday, with the S&P 500 falling by its largest margin in nearly seven weeks. Investors turned skittish as they fretted about falling commodity prices and concerns about global growth. A decline in economic activity in August, measured by Chicago Federal Reserve as well as a drop in existing-home sales contributed to the dour Wall Street mood. The S&P 500 SPX, -0.80% closed 16.11 points, or 0.8%, lower at 1,994.29. The Dow Jones Industrial Average DJIA, -0.62% dropped 107.06 points, or 0.6%, to 17,172.68. The Nasdaq Composite COMP, -1.14% fell 52.10 points, or 1.1%, to 4,527.69." "- Hong Kong stocks fell on Monday to the lowest closing level in about two months, amid growing concerns about China’s economy after comments from the finance minister suggested no major stimulus measures would be announced despite a slowdown. The Hang Seng Index HSI, -1.44% declined 1.4% to 23,955.49, its lowest close since late July. Finance Minister Lou Jiwei over the weekend said at a G-20 meeting that Chinese economy is facing downward pressure. But the nation won’t “make major policy adjustments” due to changes in any individual economic indicator, according to a statement on the website of the People’s Bank of China. Over on the Chinese mainland, Shanghai markets closed significantly lower, with the Shanghai Composite Index SHCOMP, -1.70% down 1.7%. Other major markets in Asia were also weaker. In Japan, the Nikkei AverageNIK, -0.71% ended down 0.7%, while the broader Topix index I0000, +0.00% inched 0.1% lower. The yen USDJPY, -0.17% slightly weakened to ¥109.079 against the dollar, compared with ¥109.047 in the previous session. In Australia, the S&P/ASX 200 XJO, -0.15% gave up 1.3%, while in South Korea, the Kospi Composite Index SEU, -0.62% pulled back 0.7%." Palm oil futures for December contract is retracing down for the moment amid weak respond from Soy oil recently. Current upside is likely pause due to recent candle formation, and it does not look good for long term recovery. 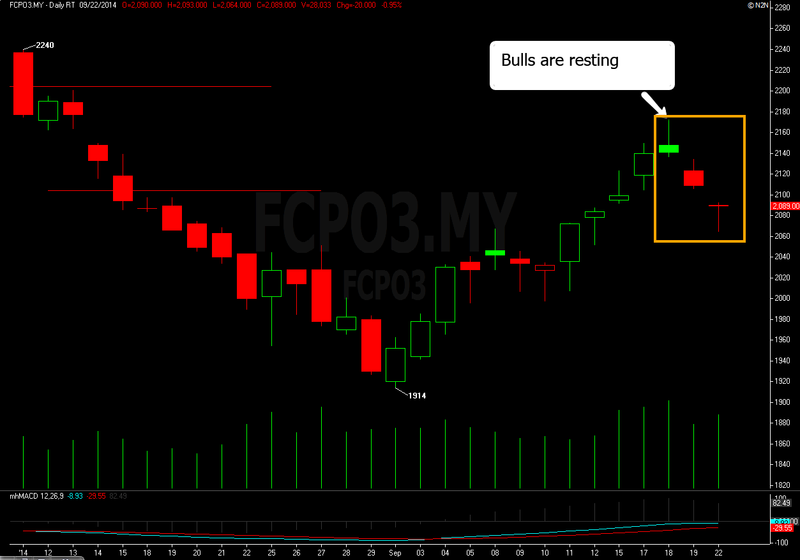 But before I go into foretelling the outlook of palm oil futures, lets take a look at the fundamental side of it. The good news was, Malaysia palm oil export is increasing to double digit growth, cargo surveyor ITS reported there was 21.2% increase palm oil export for the month of 1-20th Sept vs Aug. The export news was indeed a welcome sight, but it need to continue recording steady growth in order to reduce stocks level, that is where the real effect is going to take place. With the possibility of palm oil stocks decreasing with steady demand, we can then dream of further price recovery. For the moment, let just not hope that market would stay sideways within 2,050~2,150 for too long and too frequent. The real deal, there was two significant warning on the daily chart before the market dip down to 2,064 level yesterday. The first sign was the formation of shooting star when the price closed lower on previous Thursday after hitting new high in the morning session, about 2,172 level before closing at day low at 2,138 level. The second Bearish sign came again when December contract closed lower on the next day, it was a red candle on the afternoon session down to 2,109 level. And yesterday, the December contract declined to 2,064 on morning session but manage to closed at day high at 2,090 level. Event though the December mange to recover at the end of session, we would not expecting it to recover from this point due to new weakness on Soy oil, it was traded slightly below 32 cents per pound as the time of writing. Overall, long term perspective remain Bearish at the moment, while we might be looking at some potential for the market to recover on export news on short term, this recover might serve as chances for the Bears to join the Shorting charade. For today, pivot support is located around 2,053 while resistance is pegged at 2,100.